Hats off to RBS (not a phrase you will hear too often). 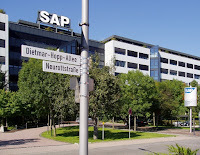 However, given the latest in a sequence of high-profile computer outages the previous week, it was brave to put Kevin Hanley, director of design, services (whatever that means), in front of a roomful of analysts and press at SAP’s Financial Services Forum in London. Sure enough, Hanley had something of a rocky ride, as he struggled in vain to keep the session on his preferred topic of innovation. Finally cracking to the barrage of questions, he admitted that the bank was likely to wrap and reduce reliance on its creaking legacy core systems, rather than replacing, working with ‘providers like SAP’. There will be significant spending over three to five years but he reiterated the corporate messages from the previous week that it is impossible to guarantee fault-free technology. The SAP event as a whole had a rather odd air, with the bullish statements from the senior speakers somewhat at odds with the recent push to reduce headcount by offering redundancy to those with at least ten years of service (and granted to one or two of those with less, who have asked) and the abrupt departure of previous high-flyer, Simon Paris, who was widely credited with sorting out a lot of the issues in the financial services business. Paris had ended up ‘rewarded’ with heading SAP’s underperforming cloud business. He is now president and head of sales at rival banking technology vendor Misys. Meanwhile, where was Hana, the in-memory platform that until recently was being touted by SAP as the answer to all of the world’s problems but, in financial services at least, has had an underwhelming reception? It barely had a mention over the two-day event, as opposed to featuring in every other sentence only a year or so ago and also at SAP’s main annual gathering, Sapphire, earlier this year.